Pro-Tect Coatings Belvedere Site in Kent, has a 14m x 4m x 4m shot blasting room which can be extended to accommodate larger structures. This is installed with a fully automated underground grit recycling system, minimizing media losses, removing dust and spent materials, ensuring that the remaining grit is abrasive. All residue is collected and removed by licensed waste contractors benefiting the environment and allowing the cost of materials to be kept to a minimum. Shot blasting is an environmentally friendly method used to remove surface rust, mill scale and paint. It is a common process carried out in almost every industry where metal is used. 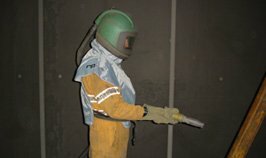 Shot blasting cleans and prepares the surfaces in readiness for hot zinc spraying, painting or powder coating. A blasting standard of SA 2.5 prepares the surface with a uniform anchor pattern prior to applying coating.